▪ Hyršl, J. (2002): Riesenkristalle aus Brasilien. Mineralien-Welt, 6/2002, 10. Pegmatite bodies can be very large and occasionally contain enormous crystals. This is a statement that every geology student can recite in his sleep; however, it is not so simple to show them what this means. Even after teaching mineralogy for many years, I was shocked during my stay in Governador Valadares, Brazil, when a friend gave me the opportunity to visit newly found crystallized specimens from a local pegmatite. In a large warehouse they lay: already cleaned crystals of quartz, orthoclase and muscovite, the largest of which measured 1 x 1 m. The number of specimens could not be estimated, surely there were several hundred, whose total weight we heard was about five tons. All had been found in June 2002 in the Orozimbo mine near Galileia in the State of Minas Gerais. We went the next day to Galileia, where luckily the owner permitted us to examine the mine. I experienced a second shock in a storage area in Galileia, where about 10 quartz crystals were lying under a primitive roof. They all came from the same pocket as the "smaller" crystals seen the day before, however EVERYONE of these weighed between one and five tons! The largest had a diameter of approximately 2 meters and was 1.5 meters high. All were marvelously lustrous and nearly without damage; white albite "balls" were perched on some. The best piece lay nearby, however - an enormous, perfect potassium-feldspar crystal (possibly orthoclase) of 1.5 meter size, on whose side were perched albite crystals and a smoky quartz crystal. Reportedly the piece weighed three tons. The crystal had been found in the pocket together with a quartz crystal of three tons separated only when a crane broke the giant during removal from the pocket. I asked about the market for such giant quartz – most are sold to Japan. 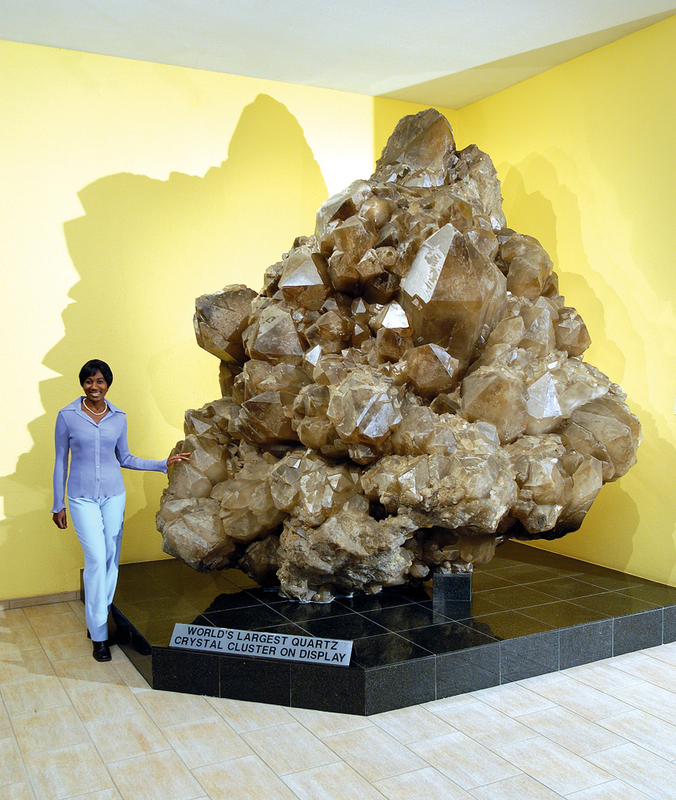 Each year in Minas Gerais some similar crystals are discovered and are saved; two years earlier in the nearby Cigana pegmatite a beryl crystal of 20 tons was discovered (naturally not in gem quality). The region is however mostly famous for gem tourmaline - we visited also the abandoned Jonas mine, where in 1978 an unbelievable pocket with rubellite crystals up to one meter was opened. We heard that the rubellite had a value of about 15 to 20 million dollars. Finally, we drove from Galileia about 15 km into the mountains to the Orozimbo mine, which has a large dump as well as an adit large enough for trucks to enter. This mine was operated intermittently over several decades, during which mainly feldspar and mica was produced. The selling price for feldspar is only 25 US dollars per ton, however each month several hundred tons were mined. Crystallized specimens like the giant crystals we saw therefore represent pure profit. The Orozimbo pegmatite forms a flat lens; the main stope is at least 30 m long and about 20 m high! The miners showed us the place on the bottom where the pocket was found, but nothing was left to see. Only some "modest" specimens were still lying near the large hole. I picked one up as a souvenir of this extraordinarily interesting experience. Caption: At the top: The Orozimbo mine near Galileia in the State of Minas Gerais, Brazil. Here in June 2002 the sensational giant crystals were found. Immediately above, we see the giant quartz with a weight of several tons; to the right the 1.5 meter large feldspar crystal, on which albite and smoky quartz crystals are attached. Photo Hyršl."" Mica sono tanto eccezionali io ne ho visto uno che era circa 3 metri o anche più. Ultima modifica di giorgiobizzo il sab 22 dic, 2018 22:26, modificato 1 volta in totale.